Please take a moment to complete this form with as many details as possible, so we can provide you with a quick & accurate outdoor channel letter quote! Brighten up your business in big spaces. Illuminated letters are custom made & individually lit to capture attention. Call us now for channel letter pricing! Make our channel letters your next bright idea! 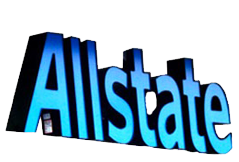 Channel letters are made of aluminum for long lasting durability and a quality appearance. Our lighted letters are lightweight and will never rust. Depending on your lighting selection, LED or Neon lighting fixtures are safely and securely installed in each letter. Your completed sign can be wired together and mounted on a raceway or shoebox for easy installation, or individually mounted channel letters offer a clean and simple look. We offer extremely competitive pricing, quick design turnaround, and a centrally located production facility. WHICH TYPE SPARKS YOUR INTEREST?